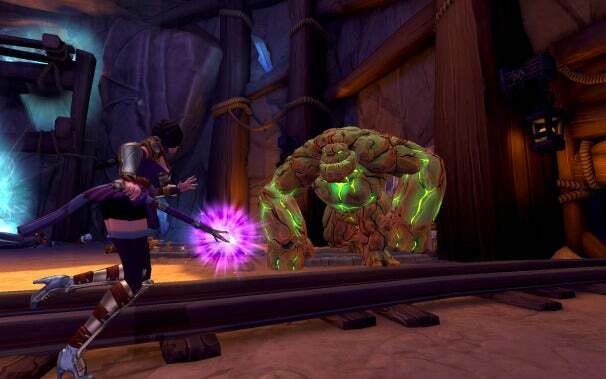 After the surprise success of Orcs Must Die last year, Robot Entertainment has been hard at work on making a sequel that could live up to the high bar that they have set for themselves. They’ve gone through and tweaked some gameplay elements to work better and added cooperative play with a new character, so that you can murder orcs with a friend! The original Orcs Must Die offered a unique perspective on the extremely stale Tower Defense genre by allowing the player to directly affect the world as a third-person action game. It worked out well, but at times it felt like something was missing. Thus the inclusion of cooperative play is one of the most welcome additions in Orcs Must Die 2; while playing the original game it was very easy to become overwhelmed while managing different pathways and trying to remember which ones were protected with traps, so having a second player there to cover your back makes things so much easier. In the short time that I had to play the game with a partner I was able to loosen up and take a reckless charge toward the enemy spawn zone for a bit, as I knew that my co-op buddy would be covering my back if any orcs made their way past me. The new character is a Sorceress and she's an excellent complement to the melee-focused Apprentice protagonist of Orcs Must Die. She wields a staff and focuses on fast, long-range attacks, making her perfect for players who like to hang back and pick off the enemy at range. Playing as the Sorceress also allows you to take control of enemy orcs’ minds, forcing them to turn against each other. While playing cooperatively players can also chain their abilities together to create combos which deal more damage than they could alone. Add in new traps, and you've got an abundance of new combat options in Orcs Must Die 2. For example, I tried pairing the Sorceress’s ranged attacks with the new triggered Ice Trap and the Apprentice's shotgun and had a blast mowing down endless waves of orcs. The trap list is also being updated for the new game, with some new traps added, some removed, and a few that just needed some rebalancing with the new additions. If you were a fan of traps like the continuous Tar Pit from the first game, you might be slightly disappointed ,but there seems to be enough new traps to more than make up for the ones that didn’t make it through the second time around. These changes are small enough that you probably won’t notice them, and that’s the point; they just work properly this time around. Robot set out to make Orcs Must Die 2 a more seamless experience throughout, and they seem to have accomplished their goal. The additional character and co-op play change the gameplay experience drastically and really demonstrate Robot’s commitment to listening to what fans want. While they’ve only shown a fraction of the new content that will be available when the game launches this summer, it will be interesting to see how players react to the changes and the sale of this as a full-blown sequel, rather than an expansion or content update.